Empowering Veterans and their supporters through education and strategic partnerships. 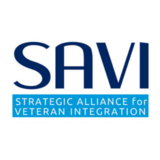 The Strategic Alliance for Veteran Integration (SAVI) is a national nonprofit organization dedicated to providing knowledge and resources to military Veterans transitioning into civilian life and to the organizations that support them. Founded in 2017 by a passionate military Veteran who has been through it all, SAVI believes in taking a whole-person approach to this transition. Our first-of-its-kind support system leans into both the latest best practices in business and our own customized programs that focus on the unique needs of the transitioning service-member. With a 360-degree understanding of these needs, we strive to make true for each Veteran the words in our tagline: Your whole life transition starts here. The transition from active duty to civilian life is one of the most abrupt and difficult changes that military personnel face. Yet the vast majority of Veterans receive little support when trying to balance reintegrating into their old norms of family and community with establishing a new career. In fact, the more than 21 million military Veterans in the U.S. are served by only 56 Veterans Benefits Administration regional offices. Given the many challenges facing this population — including PTSD, sleep problems, and depression — the majority report that their health has had a negative impact on their employability, social interactions, and daily activities post-separation. A full 30 percent of Veterans require assistive services to adjust to civilian life, with some requiring lifelong care. Lacking the comprehensive reintegration support they need, an alarming number of Veterans today are either underemployed or homeless. Even when fully employed and in stable housing, many Veterans still experience ongoing challenges beneath — and sometimes even on — the surface. Adrianne Phillips, a 100-percent service-disabled Air Force Veteran, experienced firsthand this lack of reintegration support when she returned from overseas combat in 2007 and founded SAVI 10 years later. SAVI takes a whole-life approach to assisting transitioning Veterans, as well as provides training and accreditation to Veteran service organizations and employers. For Veterans, SAVI reduces the stress of transition, helps with a successful reintegration, and provides ongoing, whole-person support. For organizations, SAVI supports their increased competency with the military and Veteran mindset, enhances their technical knowledge of VA systems and processing, and fosters greater stakeholder trust in their brands and in the effectiveness of their services. SAVI’s suite of free programming — developed specifically for and by recent Veterans — addresses the various tracks a Veteran can take after separation: as a student, an employee, an entrepreneur, or a retiree.